Jannatul Ferdous Department of Microbiology, Holy Family Red Crescent Medical College, Dhaka. Mohammad Murshed Department of Microbiology, Holy Family Red Crescent Medical College, Dhaka. Sabeena Shahnaz Department of Microbiology, Holy Family Red Crescent Medical College, Dhaka. Syeda Sharmin Duza Department of Microbiology, Holy Family Red Crescent Medical College, Dhaka. 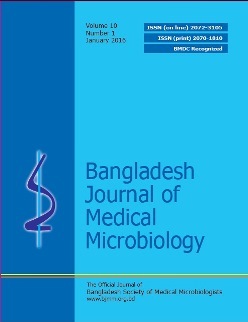 Prothoma Rahman Siddique Department of Microbiology, Holy Family Red Crescent Medical College, Dhaka. Acinetobacter species are important opportunistic and nosocomial pathogens capable of causing both community and health careassociated infections (HAIs). The clinical specimens obtained from patients admitted in Holy Family Red Crescent Medical College and Hospital (HFRCMCH) from July 2013 to June 2015. All laboratory works were performed in department of microbiology and immunology of HFRCMCH. The infection rate was maximum in blood (67.7%) followed by urine (12.9%), tracheal aspirate (8.8%) and wound swab (3.32%). Most of the Acinetobacter were isolated from Intensive care unit (ICU) and Neonatal intensive care unit ( NICU). Acinetobacter displayed higher resistance to many antibiotics like Ampicillin which showed 96% resistance, Ceftriaxone 72%, Amikacin 72%, Imipenem 55%, Meropenem 60%, Tetraclycline 64%, Ciprofloxacin 60% and Cotrimoxazole showed 38% resistance. In conclusion, there was a high resistant rate to available and common antibiotics. It seems that infection control strategies may help to control the evolving problem of Acinetobacter infections and prevent an epidemic nosocomial life threatening infections.